Look who paid us a visit over the weekend! 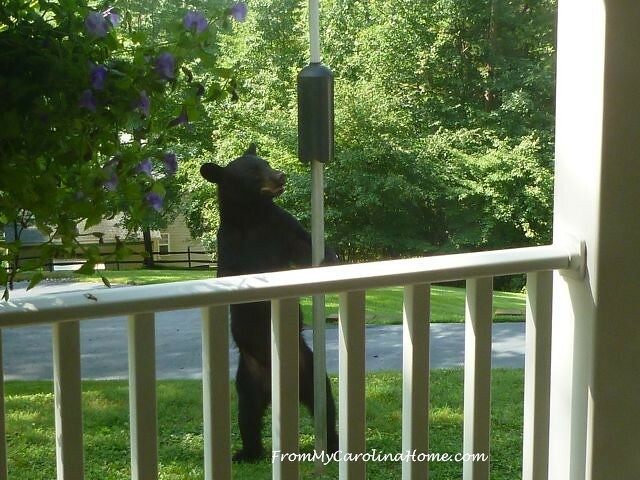 This guy thought he might try to get into the bird feeder, but he wasn’t successful. 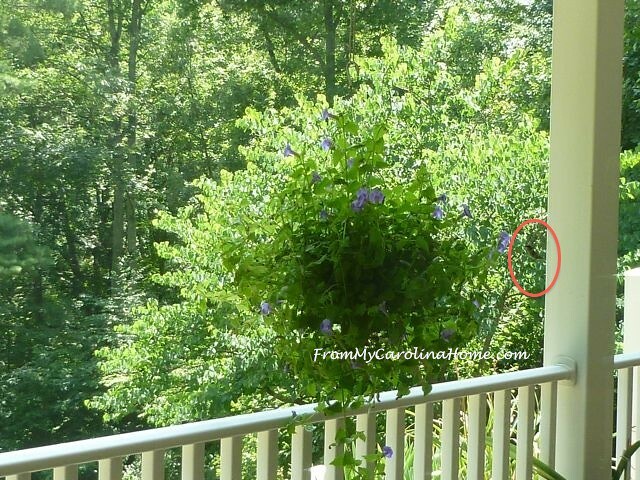 DH and I were on the inside of the sliding glass door, and we banged on the glass every time he looked at the top. 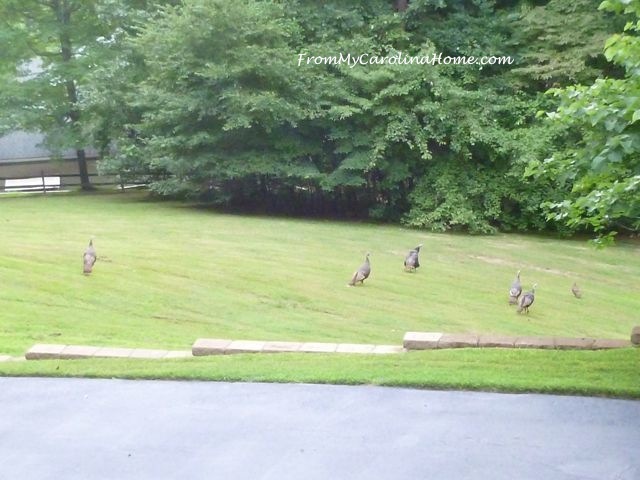 The turkeys have returned, and there were some juveniles with the flock of females. 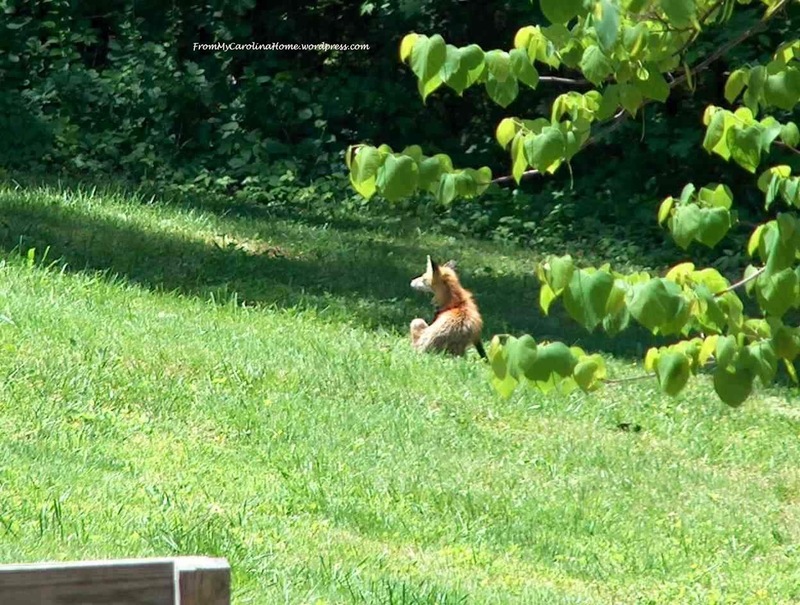 I wish I could get a picture of the two red foxes that were playing in the meadow over the weekend too. They are beautiful, with full bushy tails. One was in the meadow, and the other came running out and body-slammed the first one! They went tumbling over, then jumped up and ran back into the woods. It happened so fast I didn’t have time to even reach for the camera. I have been watching at dusk for days now hoping I would see them again. Alas, not to be so far. So, here is one picture I have been able to get, from a couple of years ago. I finally got a picture of the little female hummingbird too, she loves those purple torenias. 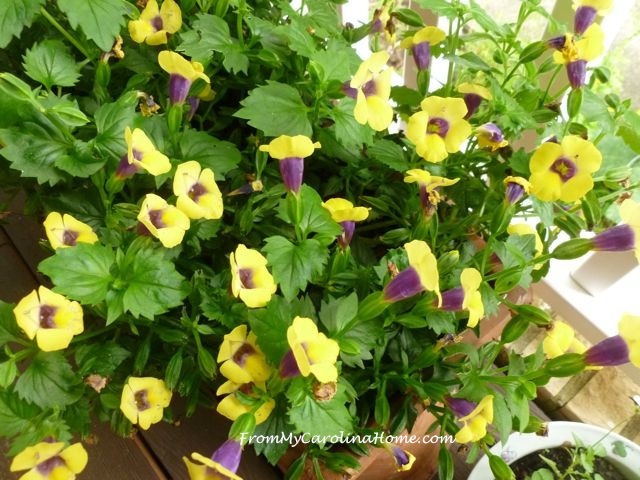 The yellow torenias are still going strong. 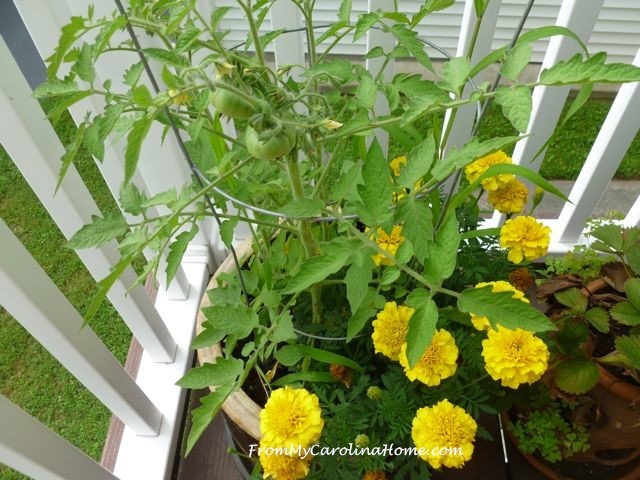 Finally, it looks like I might get a couple of tomatoes! 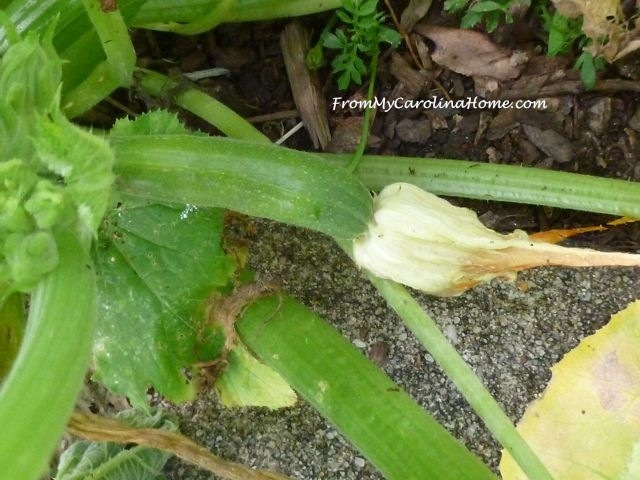 And the zucchini is growing, maybe I’ll get one or two meals from these. 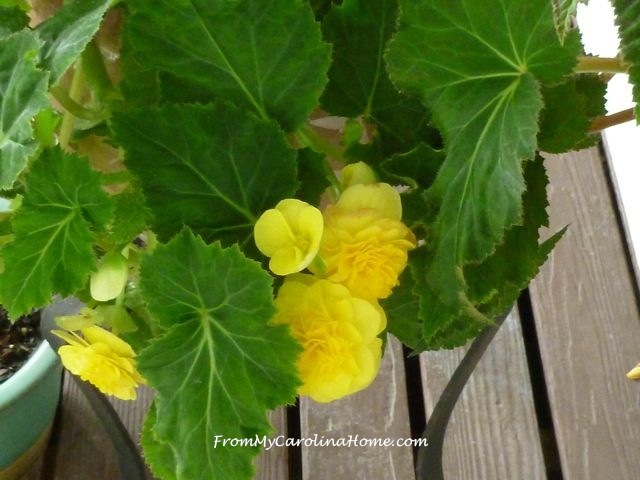 My double begonia is really doing good too, it is huge and right next to the front door. Any visitors in your garden? I Won the EQ7 Block Challenge! Maybe if you put up a game camera you could catch some pictures of the fox. We have two cameras in our yard and have quite a few pictures of different animals. Mostly night shots. Lovely pictures! We have hummingbirds, bluejays, cardinals, rabbits(some), roadrunners, and other birds, deer and squirrels and skunks and raccoon. Before more homes went up we had wild turkey. Oh my! Lovely pictures! We just have the run of the mill squirrels, snakes and hawks fishing in our pond. I’ll think I’ll pass on the bear though! My goodness….a bear! Such a beautiful animal and fabulous privilege to share with your husband and us! Love all of your animal photos today, I am a sucker for animals. LOL. So thank you for sharing and making my morning a happy, smiling start to the day. Oh, I know I have not posted anything on the mystery…but I have been working on it. Today, if all things go according to plan, I will have step three completed and be posting photos later on this evening. I am getting more excited with each step of the mystery and liking the indentation of my scrap fabric squares while doing this quilt along. Have a wonderful creative day! It’s wonderful to see more of your personal “paradise”!!! Thank you for sharing. 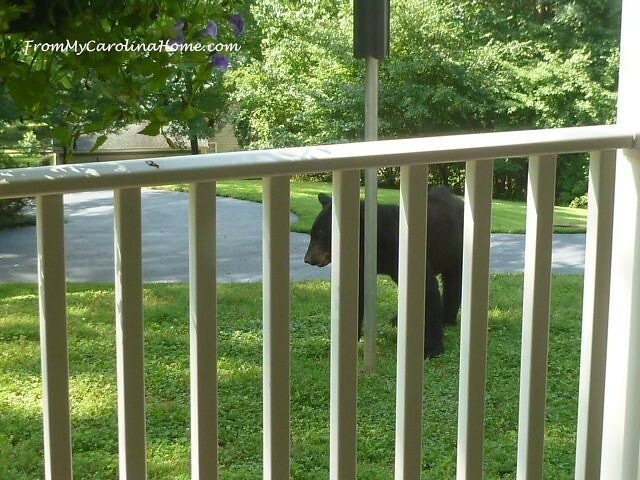 We used to have a bear run across our yard in northwest NJ, from the woods to the lake across the road. 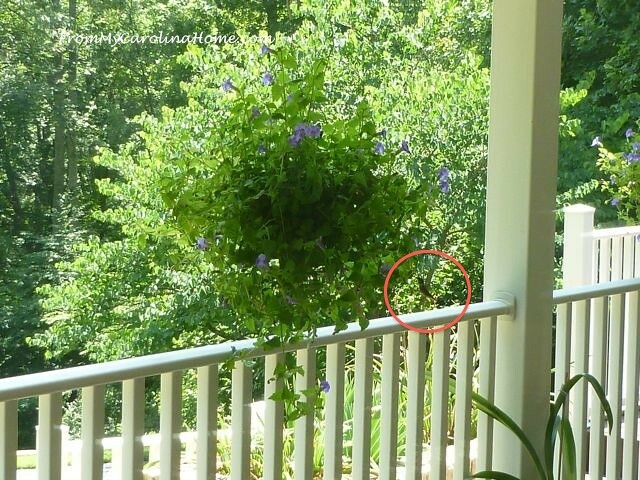 I do not miss the deer from MD, who were voracious predators in my garden. Now that we are in an apt in CA, I enjoy my Mt Diablo and western sky views from the balcony, with deer and turkeys along the trail nearby, where we walk every day. We had a fox this year too. He was just sitting facing the bright sun with his chin up and eyes closed. We also have hedgehogs which are so cute 🙂 Your bear looks HUGE! Thanks for sharing those fab photos. The biggest visitor we get is a squirrell or two…LOL!! Enjoyed this post. THANKS for sharing. 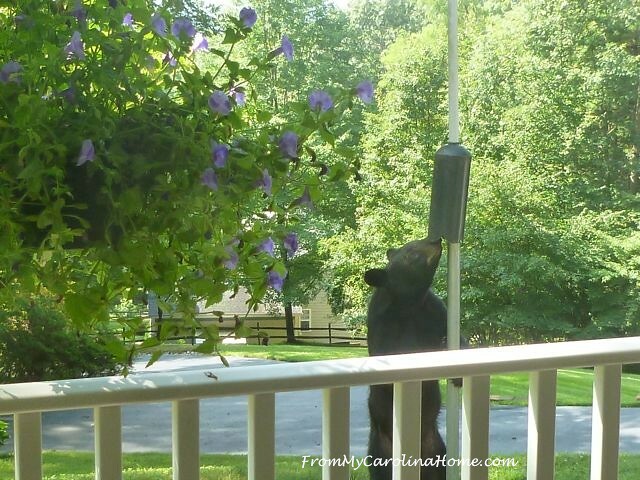 I only get magpies and blackbirds in the garden – I would have been scared watching the bear!